I would like to introduce this “Timeless Classics” series about effects with a pedal that I discovered quite recently (about two years ago) after trying and owning a lot of distortion/overdrive pedals: The Proco Rat-2. The Rat 2 is the granddaughter of the RAT, released at the end of the 70s and whose 1985 reissue model has just been announced by Proco. The RAT has been the pedal of choice of a number of guitarists including at some stage Jeff Beck. My model has a below 300000 serial number. According to Robert Keeley (who knows a thing or two about effects), the RAT 2 made after serial number 300000 (early 2008) are of inferior quality. I have not been able to compare mine to a more recent model tonewise so I will not comment first hand on that. Nonetheless, if you have your eyes on a second hand RAT 2, you might want to check the serial number under the pedal. Anyway, I find the RAT highly effective. It can go from a nice overdriven sound at lower gain settings to a fat slightly fuzzy distortion at higher gain settings. If you are into lower gain overdrive type of sounds there is a lot of alternatives but for high gain distortion types of sound (and for a reasonable price) it is pretty unique. The filter is very effective and works differently from most pedals as it cuts highs as you increase it. A slight variation can make a big difference. The volume will not provide a huge boost but a boost nonetheless. 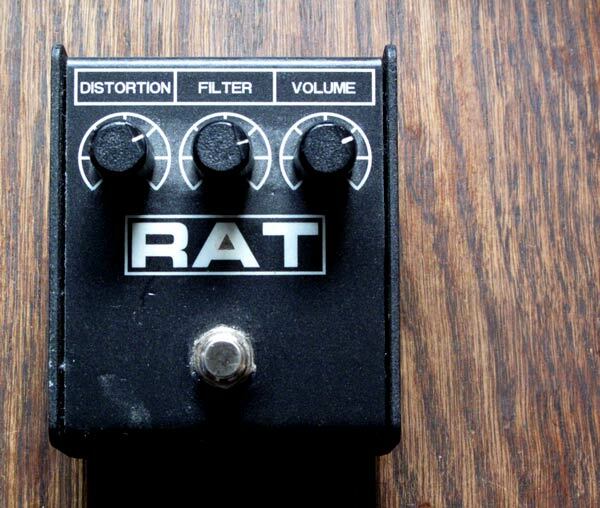 Gilmourish has an excellent piece about the RAT and explains why it is a good staple distortion pedal. In particular, I find it as effective with single coils as it is with humbuckers which is where I find most distortion pedals to be lacking. I have recorded two videos showing the fat tone you can get from a Telecaster and a RAT. I understand this type of hairy fat tone is not everyone’s cup of tea but if it is what you are looking for, chances are a proco RAT 2 will do it for you. In these clips, the settings on the RAT 2 are as follows: gain 2 o’clock, filter 3 o’clock, volume 2 o’clock. Update 24-10-2010: here is another video of my Telecaster, the Proco Rat 2 and my trusty Fender amp (same as video above). The sound quality is better and you get to hear how it sounds with a slapback echo added in the second part of the video. 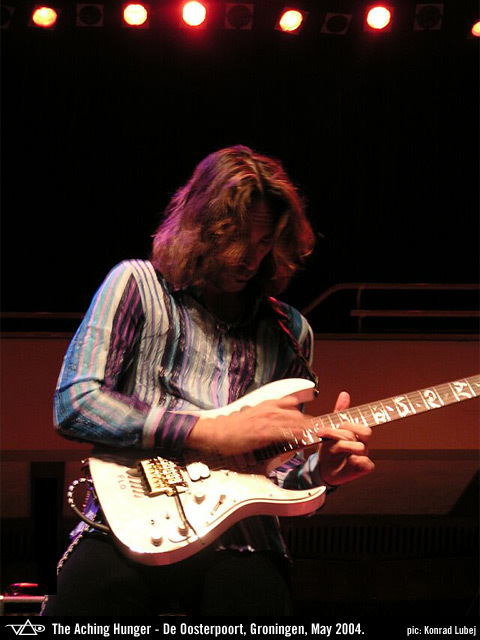 Steve Vai has decided to release some songs from his “back catalog” (as in songs that never made it on a record at the time) through his VaiTunes Initiative. Fans of the master, rejoice! There is one reverb unit and you can hear the reverb on the input as well as on every track and the rythm track. There is also a multi-effect unit which, depending on the type of input selected (guitar/bass, microphone, line) will behave as a guitar/bass multi-effect unit, a vocal multi-effect unit or a generic audio processing unit (think compression, equalization, limiting, etc.). The Guitar multi-effect unit is based on the usual COSM modeling found in BOSS multi-effects (which means that if you don’t like them, chances are you will not like the Micro-BR guitar tones). That said, there is some good stuff in there and it allows for quite some tweakability. The guitar amp models cover all the bases (from clean to heavily distorted) and some of the effects are very good, I am especially fond of the chorus/delays. This multi-effect allows to record guitars by plugging them directly into the machine, quite invaluable if you don’t have your favorite amp nearby. There is something that I miss though, it is a pitch-shifter or octaver to simulate a bass with a guitar. The rhythm track can be thought of as a ‘fifth’ track. It is actually an integrated drum box whose patterns cannot be changed. That said you can create “arrangements” (play pattern 1 for 4 measures then play pattern 45 then go back to pattern 1, etc.). It does sound “drumboxy” but can be useful for recording a demo or just practicing your instrument. There are plenty of drumming styles and a few kits to choose from and even a good old metronome sound. I especially like the TR-808 kit if you are into that sort of stuff. There is something super annoying (so much that it seems like a software bug to me): if you don’t create an arrangement for a song, the tempo will default back to 130 the next time you power up the Micro-BR. Before going into the mixing and bouncing capabilities of this little shiny machine, let’s have a closer look at the notion of “virtual track”. The Micro-BR has 32 virtual tracks. 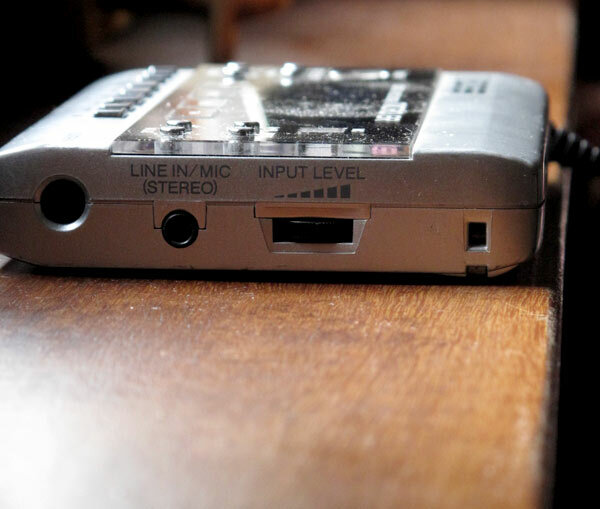 Each can contain a full quality mono recording. Out of these 32 tracks, only 4 can be played simultaneously. In other words you can think of them as “repositories”. You can for instance record 4 versions of a solo each stored in a virtual track and you can choose which version you prefer to be played alongside 3 other tracks and the rhythm track. You can also copy and paste between virtual tracks (you can select parts of the track based on time or bars which make it easy to create a composite track out of several other tracks). All the guitars were recorded with a 1978 telecaster (stock pickups) plugged into various pedals and a 1978 fender Silverface Champ. The amp was miked with an SM-57. 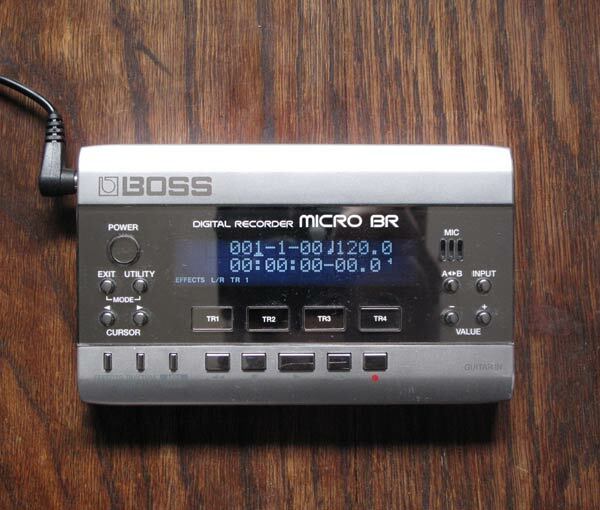 The bass was plugged directly into the Micro-BR. The drums were provided by the little machine itself (don’t you love the drum rolls ? 😉 ).